Photo from GoCobbers.com. 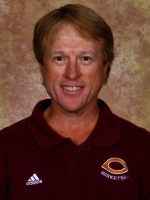 Men's basketball coach Rich Glas has been working with the Cobbers since 2008. Concordian sports writer Patrick Rundlett had the opportunity to sit down and interview men’s basketball coach Mr. Rich Glas. Here are his responses. First, being at the start of the season, what are your thoughts so far? So obviously you lost a very strong core group of players this last year to graduation. What is it like as a coaching staff and a team to lose a group like that? As a coaching staff, were you expecting this year to be sort of a transition year? From the make-up of the team and what you’ve seen in games so far, can the team, with some time, get to that level? Over the course of your career, you’ve seen a lot of different teams come in and out. Are there things or principles you try to establish? With a young group like this, is it more difficult to get people on the same page with that sort of mindset?